Scout Boats was founded by South Carolina-resident Steve Potts – a man that continues to this day to be on the shop floor daily working on the models – back in 1989. From the very first 14-footer to the now expansive offering of more than 20 class-leading models ranging from 17’- 42’, one of the many consistent items that sets Scout apart from other manufacturers is product quality. 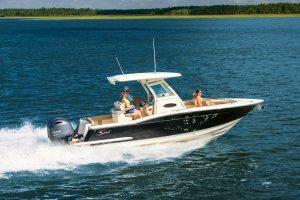 Within the marine industry, there are numerous manufacturers producing all types of boats for consumers, but none with as much thought and effort as Scout puts into its models. Year after year, the Research & Development team create stunning new model after new model. So much so that Scout has introduced more than 25 new models in the previous six years alone. No one else in the industry has even come close. And not only are new models continually being developed, they are the most innovative, attractive and highest performing models in their class time after time. Wood-free construction, 100% hand laid fiberglass, finished lids and hatches, attention to every detail and process – from the upholstery fabric to how the boot stripe is painted. They’ve even created a series of short videos that bring you into the facility and show you exactly how the boats are made differently, and made better. In its nearly 30-year history, Scout has established its presence and continually gains market share each and every year at a significant rate against competitors that have been around for much longer. Scout has revolutionized the coastal fish boat market. Scout’s NuV3 hull design is another engineering marvel. This ‘convex’ design is comprised of variable degree angles in the hull, offering immense fuel efficiency and the softest, driest ride in its class without sacrificing performance. Scout’s Air-Assist three-piece hull creates static stability, adds additional longitudinal buoyancy which enhances static floatation, decreases time to plane and vastly improves overall handling characteristics with the added benefit of increased fuel economy. Scout’s Stepped Hull Technology achieves an approximate 10-15% performance increase over conventional hull designs with similar deadrise. 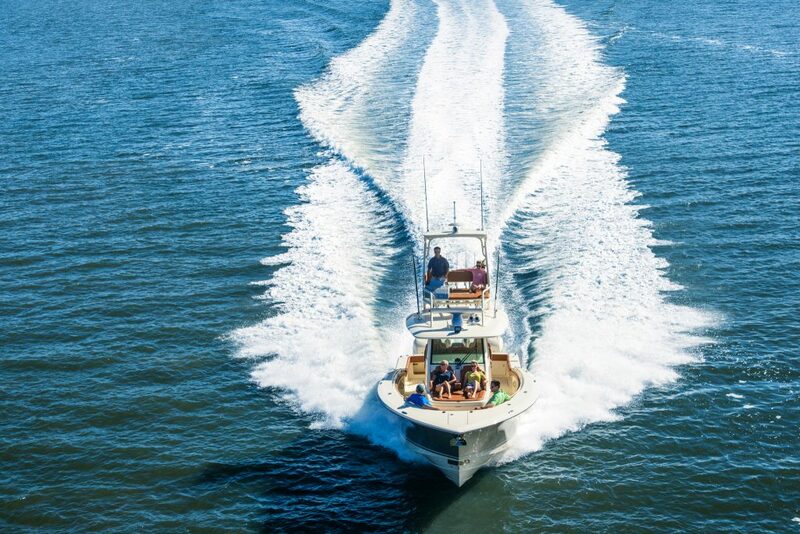 By reducing the hull’s wetted surface, the overall effect creates a faster, dryer and better performing boat requiring less horsepower and increased fuel savings. You can’t talk about Scout without talking about its flagship model, the stunning 420 LXF. 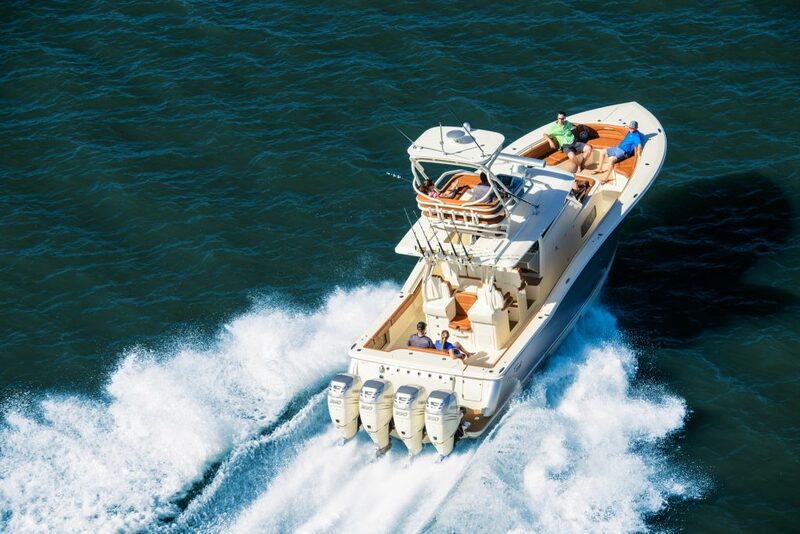 Scout’s LXF Collection is comprised of luxury sportfish models that showcase a unique blending of high-performance fish boats with high-end cruisers. The cross between these two popular recreational marine mainstays allows one to enjoy amenities on this collection normally only found on much larger sportfishers. The 420 LXF is the sixth model in this category to date, headlining the 255, 275, 300, 320 and 350 LXF models. 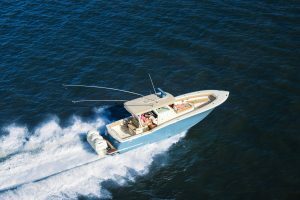 The 420 rivals even some of the larger luxury sportfishing machines with its appointments, technology and attention to detail. 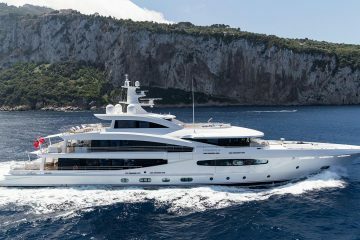 It was in research and development for three years prior to its debut, getting outfitted with numerous state-of-the-art innovations and amenities. Over 400 hours were put into testing the epoxy-infused double stepped hull developed for this model. Epoxy-infusion provides more stability in the hull while reducing the overall weight in the boat, countering the long term industry belief that a larger boat has to be heavy to perform. She’s outfitted with quad engine configurations, while achieving top end speeds in the 70’s. Timeless styling, sleek aesthetics and technology are three main pillars of this flagship. Scout’s built a reputation for being first-to-market with innovations throughout its history, and the 420 carries the company philosophy forward with perks like the optional hydraulic port side beach platform with stowable pocket ladder – ideal for boarding/de-boarding safely away from the transom and engines – and the optional three Garmin 17” or 19” touch screens at the helm. (Three Garmin 8215 15” screens come standard.) From the helm and the key fob, the owner can control features throughout the model with the help of C-Zone digital switching technology as well. 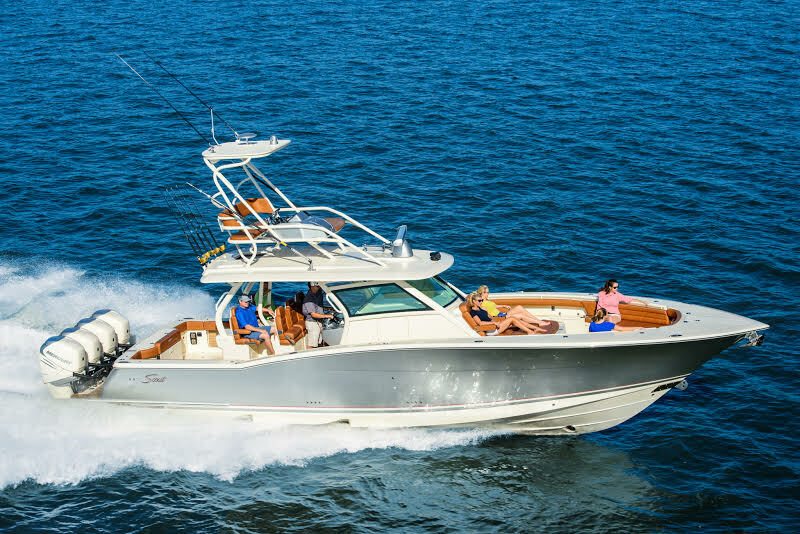 There’s also an optional SeaKeeper gyro stabilizer, flybridge, articulating rocket launchers that work in conjunction with the retractable SureShade, and a 5-N-1 second row seating configuration that won a marine industry innovation award. 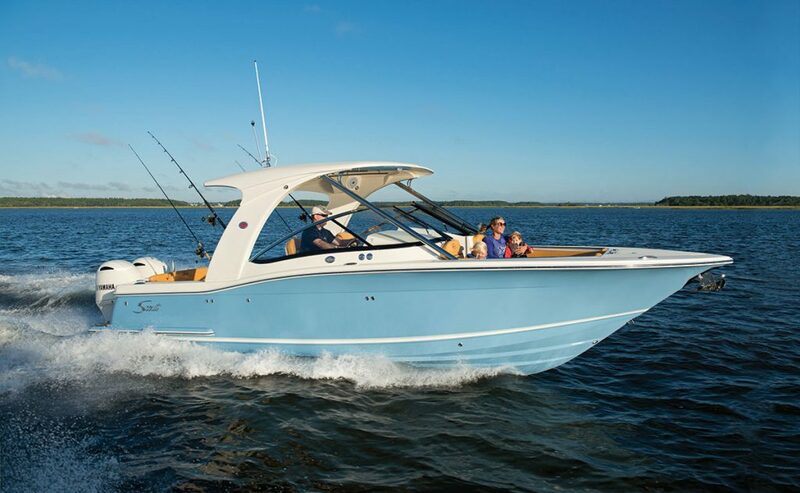 Standard features throughout include a full transom walk-thru platform (with optional dive ladder); a side boarding door; gas shock-assisted hatches; flush mount cleats and rod holders; port and starboard floor fish boxes with overboard diaphragm discharge; a patented powder coated hardtop with curved glass enclosure; under hardtop/under gunnel LED lighting; a three-person aft facing cockpit seat; two retractable fresh water hoses; a retractable raw water hose; and Eco-Teak swim platform, transom door, bow table and helm footrest, just to name a few. 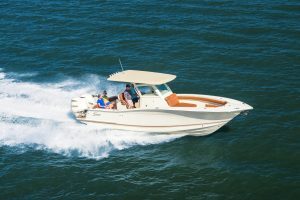 The boat also comes standard with a Garmin helm Wi-Fi router, Fusion stereo with eight seven inch speakers, amp, forward deck remote control and Bluetooth compatibility, a JBL Sound Bar in the cabin, AGM glass-pack batteries with two chargers, and dimming courtesy under bolster and hardtop lights. Other notable systems include an anchor windlass wash down hose, water heater, Kohler generator, electronic bow table with filler cushion, and air conditioning. Access for service to the main systems on the 420 is made easy with the help of a midship systems room and a stern accessible room. Down below, the appointments resemble the elegance of those on a private jet. You’ll find a two burner glass stove cooktop, microwave, flush mount 32” flat screen TV, DVD player, galley sink, drawer refrigerator, enclosed shower area with sump and an enclosed head area with a full size toilet and sink with hot and cold water. Stainless accents can be found throughout, while two single beds come together to make one large King berth. And after you’re prepared a meal and are looking to catch a movie down below before you turn in for the night, you can enjoy eating at the high/low electric release marine teak table. The 420 also provides customizable features for its owner, such as custom painted engines and a SureShade integrated retractable awning. 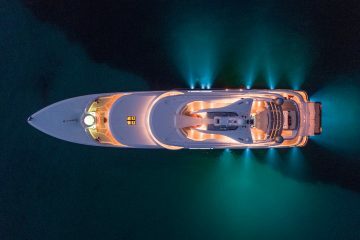 Underwater deck and bow cameras are available as well as underwater LED lights. 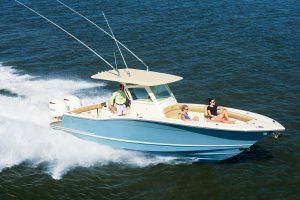 Upgrade the standard upholstery package to the Brisa or Italia package, maneuver with confidence in tight spots with the proportional bow thruster, and enjoy a cockpit table or fighting chair alongside your optional electric grill. 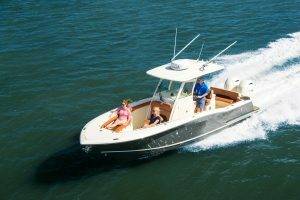 For more information on Scout and any of its innovative model lineup; to request a brochure, quote or test drive; or to build your own Scout model, visit www.scoutboats.com today.